If you were at UT when I was there in the early seventies, you may remember a little magazine-sized booklet called “I Was a Teenaged Teenager.” It was a collection of columns I had written for the Daily Beacon and also included cartoons by Kingsport native – and my roommate – Dan Pomeroy, who was the Beacon’s cartoonist. Dan and I published it ourselves in 1971. Our little “book” sold for 50 cents and we sold out all 500 copies. After paying the printer, I think we netted a hundred dollars. Which we split. That was my last experience with a column collection. Until now. 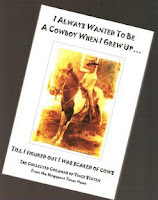 I chose that title because as I read through my choices I noticed how infatuated I was as a kid with cowboys and cowboy movies. The title is true. I did want to be a cowboy until I noticed that when visiting my grandmother’s farm I would shy away from the cows. They scared me. I knew then I wasn’t going to be a cowboy. I guess the next best thing is writing about them. The official publication date for the book is Saturday December 8. Which means the book arrives just in time for Christmas. The exclusive distributor for the book is Up Against the Wall Gallery at 316 Market Street in Kingsport. The gallery is owned by my good friends Mike and Lisa Anne Milhorn who are also the publishers of the book. The book will be introduced Saturday at a book signing in the gallery from 10 a.m. till 2 p.m. I hope you can join me at the signing, say hello, tell me a Kingsport story or two. The book sells for $19.95 plus tax. If you can’t stop by Saturday, you can visit the gallery any weekday between 9 a.m. and 5:30 p.m. Or you can place an order via phone. The number is 423-246-7210. Or you can order over the internet by sending an email to mail@upagainstthewallgallery.com. But I’d prefer you come by and see me.